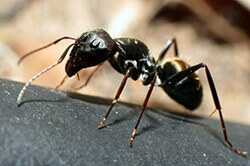 Carpenter ants differ from termites, which use wood as a food source and will eat sound wood. Carpenter ants do not eat wood; they nest in wet or water-damaged wood. Sometimes they find a void to serve as a nesting area. Most carpenter ant damage occurs during the summer months. Large numbers of ants can be destructive, yet most times they are more of a nuisance than a serious threat to the structure. In most circumstances, they can coexist with humans until managed with IPM methods. Carpenter ants first create a main colony (nest). As the colony grows, the ants form satellite nests. In managing carpenter ants, it is important to locate all the nests. The main colony and satellite nest, if present, can exist inside the house or outside, near the house.